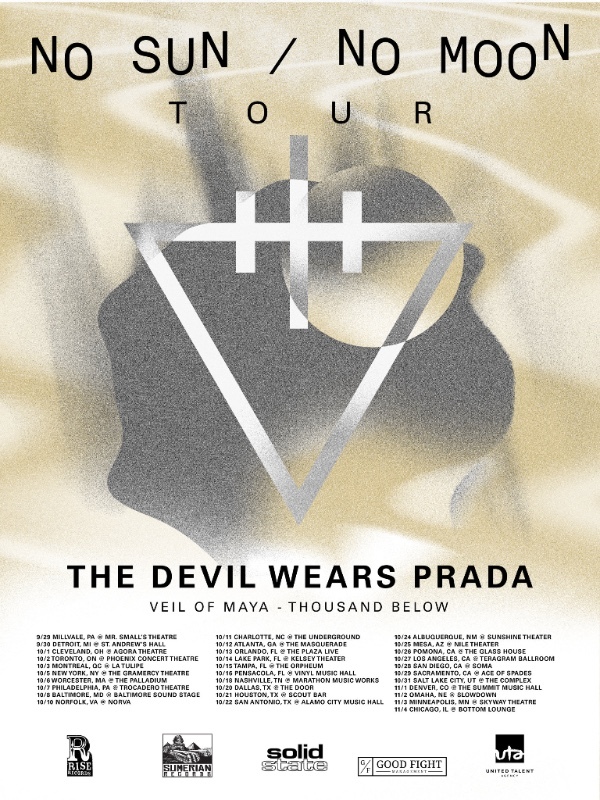 Fresh off a spring run with Killswitch Engage and Anthrax, The Devil Wears Prada will return to the road this fall on a headline tour, dubbed “No Sun / No Moon.” The tour will feature support from Veil of Maya and Thousand Below, with a special guest to be announced at a later date. The tour launches on September 29 in Millvale, PA and runs through November 4 in Chicago. As an added bonus that is sure to delight fans, all tour attendees will have the chance to pick up a free download card for the No Sun / No Moon documentary at the band’s merch table during the show. The documentary chronicles both the writing and recording process for Transit Blues [Rise Records]. It is an intimate look into the band’s most recent album and it’s one that invites fans into the band’s creative orbit.